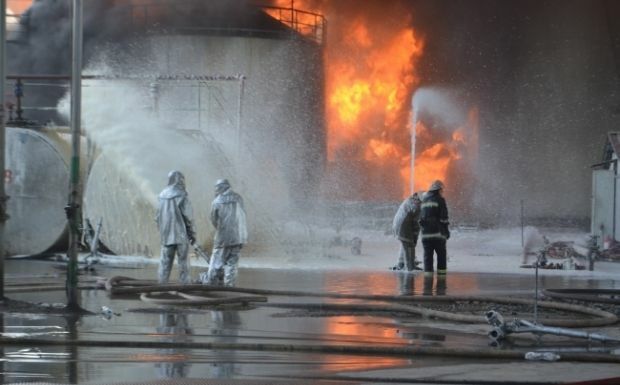 The State Emergency Service of Ukraine has confirmed reports that the oil depot owned by BRSM-Nafta in Vasylkivsky district near Kyiv has caught fire again and there is a high probability of a new explosion. The death toll of the fire is five people already. At 1150 Kyiv time on Saturday, a fuel tank with a capacity of 900 cubic meters was hermetically unsealed, which resulted in a fuel leak, followed by a fire outbreak, and caused a jet fire of an adjacent fuel tank with a capacity of 900 cubic meters, the emergency management agency's press service told UNIAN. Rescue workers first tried to cool the first fuel tank with fire-fighting monitors and covered up fuel spills with sand. Prior to that, at 1120 Kyiv time on Saturday, firefighters launched a foam attack on the destroyed tank where diesel fuel had been evaporating from, and created a foam cushion at the places of the spills. Simultaneously, diesel fuel from BRSM-Nafta's oil depot was pumped over to the nearby oil depot owned by KLO. By noon, 800 cubic meters of diesel fuel had been pumped over. The temperature of the diesel fuel was 32 degree Celsius. Forty fire-fighting vehicles and 180 rescue workers and firefighters from Kyiv, Zhytomyr and Chernihiv regions are now at the scene, which is being guarded by 70 members of the National Guard of Ukraine. The tanks at the oil depot are not being cooled now, Chairman of the State Emergency Service of Ukraine Mykola Chechetkin said on Saturday. "No attempts are being made now to cool the tanks, as there is a high probability of a new explosion due to high temperatures," he said. At the same time, all the equipment has been prepared for a new foam attack as soon as it becomes possible, he added. According to local residents, the smoke of the fire is moving in the direction of Kyiv. As UNIAN reported earlier, a fire broke out in the BRSM-Nafta oil depot in Kyiv region in the evening of June 8. The fire began in one fuel tank and spread to another 16 tanks. A total of 17 tanks are located at the oil depot. The fire killed five people, while another 15 people are reported to have been injured and taken to hospital. The State Emergency Service previously reported that the fire had been put out and there was no tank burning as of 0700 Kyiv time on Saturday. The Interior Ministry initiated a case under Article 275 of the Criminal Code to investigate the death of people during firefighting. It was also reported that a case under Article 273 was opened, with the Interior Ministry saying that the oil depot had not been properly commissioned. Later, a Security Service of Ukraine (SBU) official announced that the SBU had also opened a criminal case on charges under Article 441 "Ecocide" of the Criminal Code of Ukraine. Станом на 13-50 - пожежа набуває сили... Наш кореспондент, чого я не одобрюю зовсім, але лізе у саму гущу - знімає відео у 30-50 метрах від пожежі... НІХТО НЕ ГАСИТЬ ПОЛУМ'Я! ЦЕ ФАКТ! Posted by Тихолаз Ігор on 13 Июнь 2015 г.
Footage by activist, journalist and Editor-in-Chief of Schit i Mech Ukrainy (Shield and Sword of Ukraine) public TV Ihor Havryliuk, posted by Ihor Tiholaz on Facebook on Saturday afternoon. According to Havryliuk, the flame is very strong and it is impossible to breathe without a respirator. The scene is circled by the security cordon. One fire-fighting vehicle got stuck and was abandoned on the scene. There were almost no rescue workers around the burning tanks. "The fire goes on. Nobody is trying to extinguish it. People have been evacuated. We thank our leaders for having saved the people. The oil depot continues burning," he said.